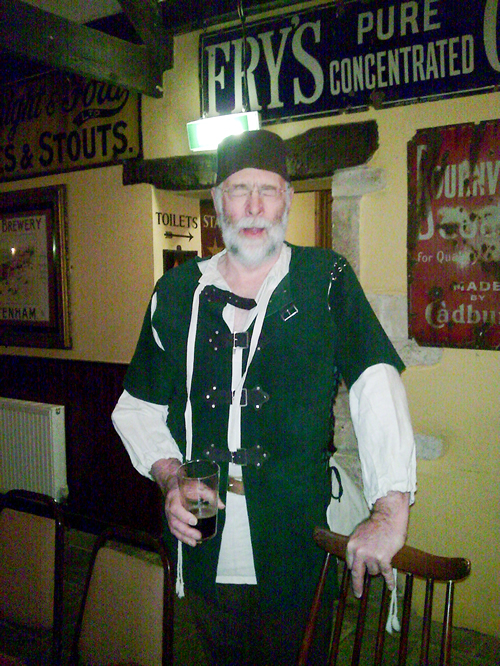 The Feast of Saint Wulfstan - 2009 - This was celebrated in the village again (our third occasion) on his Saints Day, 19th January, and a great time was had by one and all. I don't remember the horns though. The supper paid homage to aspects of Wulfstan’s time in Hawkesbury, with Goose Terrine and Cornish Yarg - cheese encased in nettles. As St Wulfstan is the Patron Saint of Vegetarians (and Peasants) the meal reflected that as well. Wickwar Brewery came up trumps once again with St Wulfstan Ale available to help wash the food down and the beautiful vegetable based decorations made by Linda and Mary really set the scene. 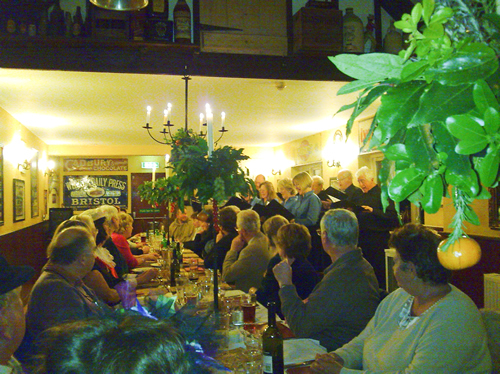 Entertainment was provided by Marshfield based singers “Chameleon” who were absolutely brilliant and the evening was rounded off with a superb talk by Wulfstan ‘Wullie’ Perks of Yate who made everyone laugh with tales of his life complicated by being named after his hero. £474 was raised for our St Wulfstan plaque fund and huge thanks must go to everybody who took part and contributed to the event, including Louise, Janet, Reverend Elizabeth and the staff of the Beaufort. We now have over £1000 for our cause – roll on the next event!